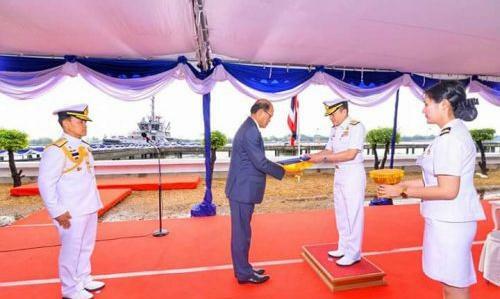 Event : Royal Thai Navy accepting the H.T.M.S. Panyi’s medium tugboat from Ital thai marine in the christening ceremony. 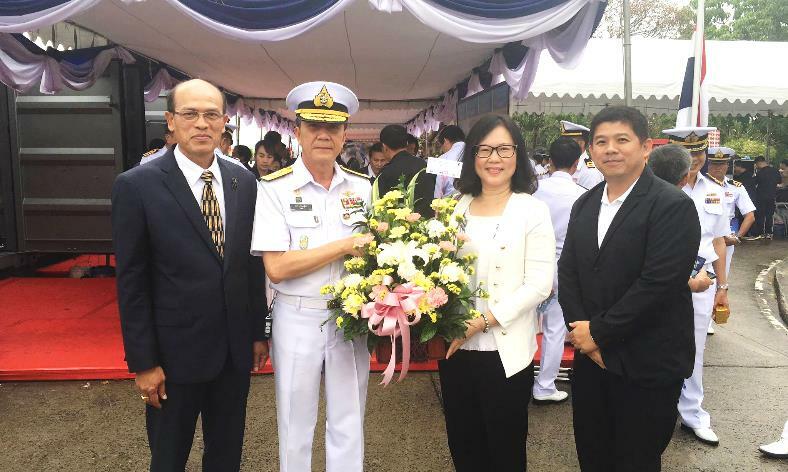 EA Mechanics Company Limited was invited from Ital Thai Marine Company limited to attend the christening ceremony of the H.T.M.S. Panyi’s medium tugboat. We received the great honor from Adm. Na Arreenich, Commander in Chief of Royal Thai Navy to be president together with Adm. Sucheep Whoungmaitree, Commander in Chief of Royal Thai Fleet and Rear Adm. Chanin Padungkiet, Commander of the Amphibious and Combat Support Service Squadron (ACSSS). At Amphibious and Combat Support Service Squadron (ACSSS), Bangna, Bangkok on Monday 27th March 2017. 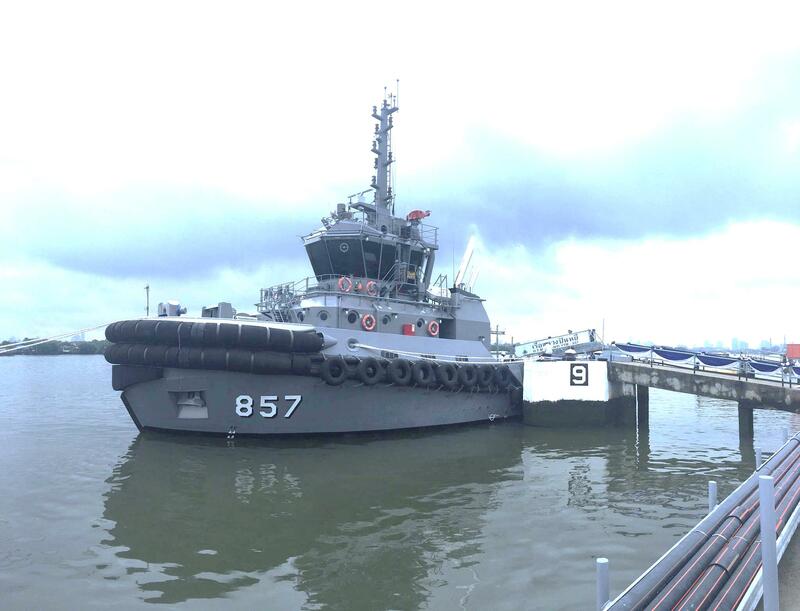 The Royal Thai Navy hired Ital Thai Marine Company limited to build H.T.M.S. Panyi’s medium tugboat. They had signed the contract together to build the tugboat on Thursday 17th September 2015. After that, they organized the keel laying ceremony on Tuesday 19th January 2016 and launching ceremony on Wednesday 12th October 2016. 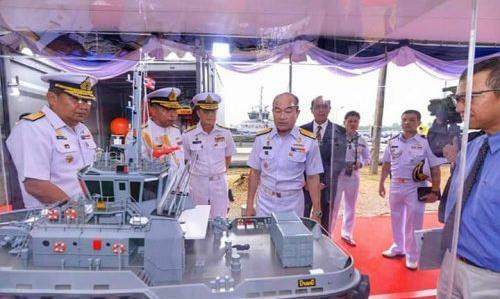 The Royal Thai Navy invested 338 Million Thai Baht for building the H.T.M.S. Panyi’s medium tugboat to achieve the equivalent of global standard tugboat. The operational capabilities of the tugboat are able to support all the activities to be more effective as towing and pulling bigger vessels (static bollard pull 56.5 metric tons and maximum continuous 12.72 knots), resist stability at sea state level 3, onshore and offshore firefighting and oil spill cleanup in the sea. And the overall specification of the tugboat are as follows, the length at 32 meters, breadth moulded at 12.40 meters, beam moulded at 5.40 meters and maximum full load at 4.31 meters. Ital Thai Marine was hired the world famous vessel designer company, Robert Allen Limited from Canada to design and select many great component brands to build this tugboat. Definitely, 2 main engines and 1 drive fire-fighting pump engine from EA Mechanics are also one of the components selected by Royal Thai Navy for this important project. In the ceremony, EA Mechanics representatives Khun Supranee Soonthornsawad, Director of Finance and Khun Pongpat Patarasoontornwong, Service Manager presented a bouquet of flowers to Rear Adm. Tula Ketusathian, Chairman of Purchasing of Royal Thai Navy and Khun Wirat Chanasit, Managing Director of Ital Thai Marine to congratulate this successful project and express gratitude for the great opportunity to be the selected choice for Royal Thai Navy. The H.T.M.S. Panyi’s medium tugboat as the last tugboat named by The King Rama 9th Bhumibol Adulyadej. EA Mechanics representatives Khun Supranee Soonthornsawad, Director Finance and Khun Pongpat Patarasoontornwong, Service Manager presented a bouquet of flowers to Rear Adm. Tula Ketusathian, Chairman of Purchasing of Royal Thai Navy and Khun Wirat Chanasit, Managing Director of Ital Thai Marine. Khun Wirat Chanasit, Managing Director of Ital Thai Marine presented the tugboat’s certification to Adm. Na Arreenich, Commander in Chief of Royal Thai Navy. The president of ceremony’s visiting an exhibition.